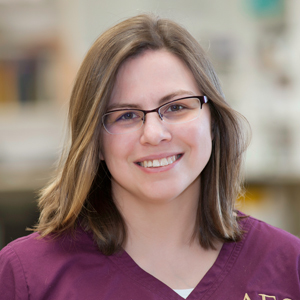 Pam is a receptionist and veterinary assistant at AEC. She is currently pursuing a BS in Biology, and later plans to attend veterinary school. Pam has wanted to be in this field since the 6th grade. She grew up on and around farms, and has helped vets deliver calves or administer vaccines. She joined AEC in 2008. "I continue to be impressed at how our staff is so determined to find out 'why' on every patient. They really care about making a difference and helping a pet to get better." Pam has a Crested Gecko named Bob.